Earlier this year I travelled along the west bank of River Indus for an assignment from Karachi to Peshawar. Only a patch of 17 kilometres of the entire Indus Highway (N-55), which starts from Kotri in the south and ends in Peshawar, crosses a part of the vast Federally Administered Tribal Areas (Fata). Darra Adam Khel lies just 35 kilometres east of Peshawar city where the sound of gunshots echo in the mountains from dawn till dusk. Hearing the gunshots, from all corners of the town, at first makes one feel like one is in a war zone, but this is the town famous for its arms manufacturing. It is common to see tribesmen carrying weapons strapped on their shoulders. And the resounding gunshots are of weapons manufacturers testing newly-made guns. They point fire on a space dug in the ground; earlier they would shoot in the air to test their weapons. There are around a thousand shops that manufacture arms in the area, and the skill of manufacturing, which is more than a century old, has been passed on from generation to generation. They are skilled at making different kinds of weapons, from 12-gauge shotguns to pistols to AK-47 Kalashnikovs and much more. So apt are these weapons-makers that they can copy a design just by looking it up on Google. 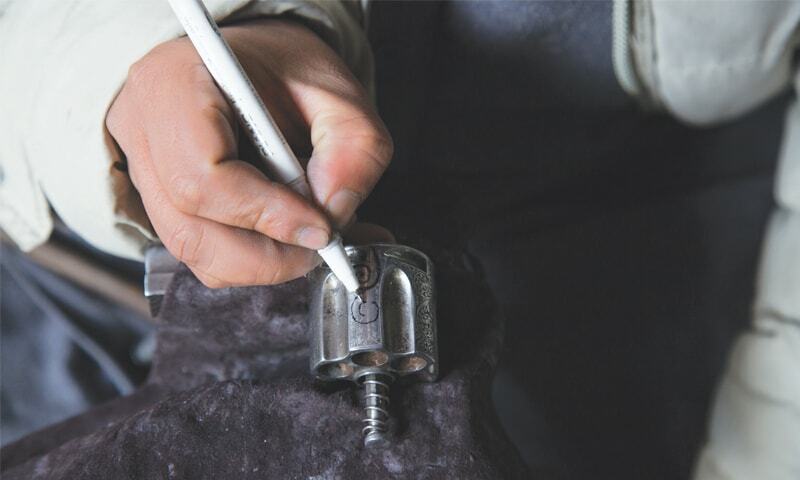 In the past, the craftsmen used to make copies of the weapons used by the British Army. However, the market picked up pace during the Soviet-Afghan war in the 1980s, when weapons in large numbers were supplied to the insurgent groups known as the mujahideen, trained by the Pakistani military and funded by the United States and Saudi Arabia. The craftsmen mark that period as a glorious time of their lives, when they were held in high regard by everyone. Keeping a weapon is still a social necessity among tribesmen and, with time, craftsmen have innovated different art forms, drawing designs and patterns on guns to customise them. 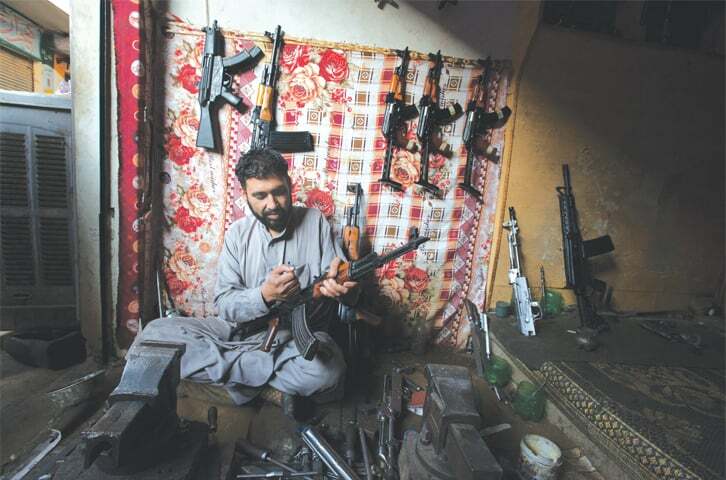 Thirty-eight-year-old Intezar Hussain uses a pen to draw miniature designs on weapons before he starts engraving on them. He told me that he is an expert in drawing miniature birds, animals, floral designs and trees. 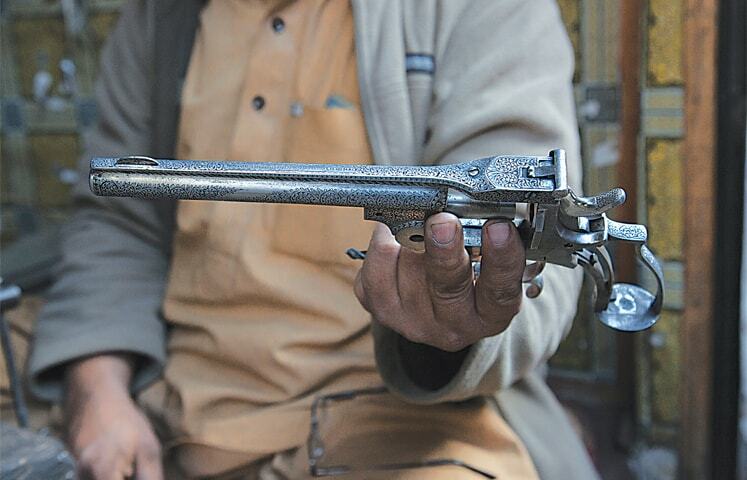 Intezar is among the only six people in Darra Adam Khel who are skilled at engraving art on weapons. Previously, it used to be easy for him to earn a living with that. 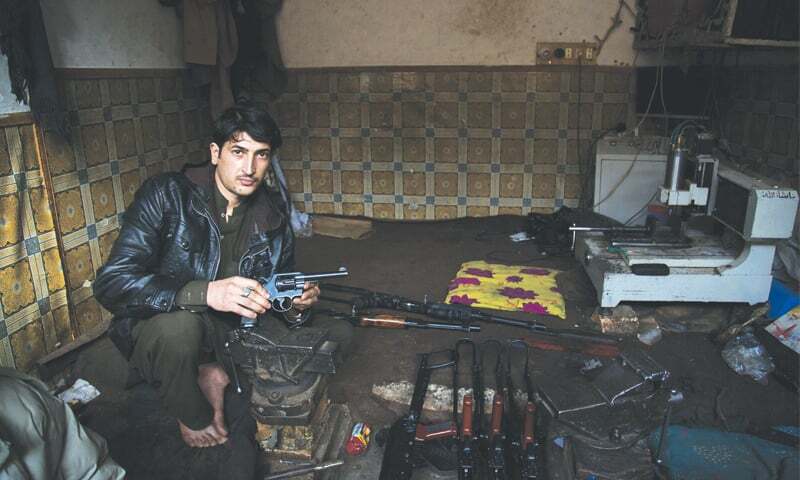 He would earn 2,000 rupees a day, which has now come down to 500 rupees a day as there are not many customers for guns. Neither can people carry their guns openly as they used to before Operation Zarb-i-Azb was carried out by the armed forces of Pakistan against various militant groups in the tribal belt. This was the hardest time for gun-makers as a lot of manufactures had to close shop when the government put a ban on arms manufacturing to prevent weapons being supplied to the Taliban and other militant groups. Keeping a weapon is still a social necessity among tribesmen and, with time, craftsmen have innovated different art forms, drawing designs and patterns on guns to customise them. However, since that is the only skill most of the people of Darra Adam Khel have, they keep on making arms, just at a slower pace. Next articleCan China help Pakistan deal with smog?